Unfortunately fish isn’t usually one of our kids’ favorite foods – have you ever tried fish pizza? That’s why we developed a yummy, squeezable alternative, like a Go-GURT®, to provide the critical Omega-3 little ones need for healthy brain and body development with cute animal friends that make it fun!. What do you get when you combine Omega-3 and CoQ10? A Healthy Heart of course! We’ve taken the o-mazing benefits of Omega-3 and combined them with the powerful antioxidant CoQ10, to give you two heart-healthy supplements in one delicious daily experience. The best part…it tastes great! Each serving has your full daily dose of both heart-boosting supplements. OK; so I could lie and tell you that my children eat well rounded meals at every meal.....however I'll spare you. They have a tendency to push foods that they don't like around on the plate, eager for "fun foods" in place of the healthy choices that I have offered. Because of their sporadic eating habits I like to make sure that they have a multi vitamin every day. So if there is an area that is lacking in their diet.....their covered. 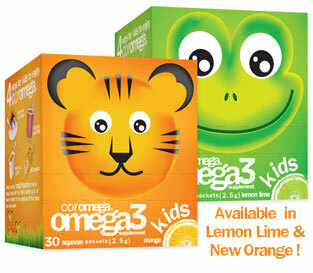 Recently I came across Coromega, a company that knows kids well! 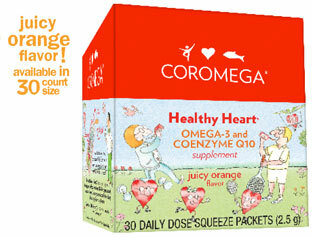 Coromega has made taking vitamins a fun & yummy experience for little one's! We received the Coromega Kids Squeezable Vitamins in both orange and lemon lime, not only did the kid's love them, they have actually been reminding me about their vitamins daily! Coromega also offers a variety vitamin supplements for adults and for prenatal needs. My girls love their vitamins and I have been hearing awesome things about Omega 3 but am afraid of the fishy after taste. No fishy aftertaste? if so , I may be looking into these..for sure!